Control of green sand properties is absolutely fascinating ! We love sand; isn’t it more beautiful at the foundry than at the beach ? This article underlines the most important concepts to help you avoid sand-related casting defects. Let’s start generating more value from your molding line today! Maybe you’re a neophyte to the subject ? We’re happy to introduce you. Green sand is a live and complex creature with properties evolving through the magic of time. 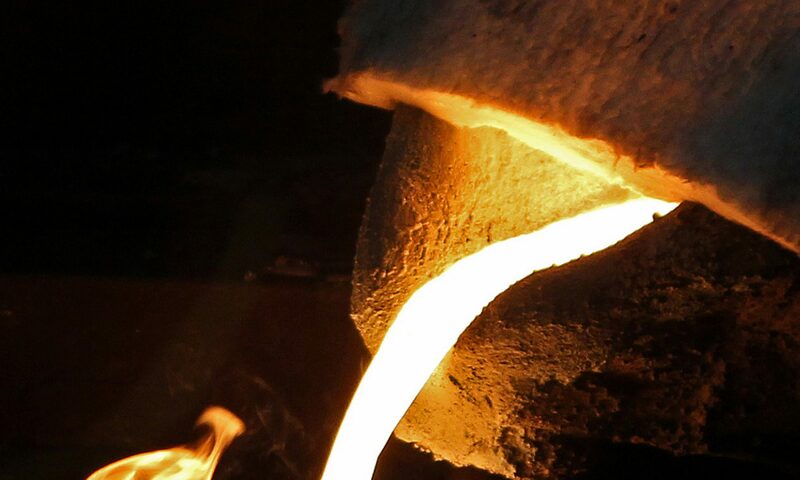 Composition of green sand molding mixture for iron foundries typically consists of 100 parts silica sand, 8 parts bentonite clay and other additions like carbon ( 0,3 parts ) or cereals and 3 % water content. It’s called “green” because the mold strength is developed with mechanical (compression) stress; not by a chemical reaction nor heat. Green sand for aluminum requires diligent care too, but it suffers less than iron thanks to a lower melt temperature. Let’s now fast forward. Subscribe to SF blog today for next articles on green sand and casting tech. How many different lab tests your sand technician should execute, and how often? Let’s start with a practical reference in the industry : Albert Fontaine and his categories for green sand properties correlation. Correlation proves to be statistically significant within the properties of a given category ( table 1 ). Permeability doesn’t correlate well with any of these tests. Figure 1 shows an example of high statistical correlation between two variables ( refer to table 1). Not a perfect match but close enough. Figure 1 : Evolution of compactibility index % versus Moisture Content % to show high correlation ( 8 parts of Bentonite for 100 parts of silica sand ). That’s why you use compactibility % to have a quick value of water content % . But are you measuring and archiving your sand properties cost-effectively in-line and at the lab? We’re installing our first V-Cat system soon at a foundry here in Canada and in USA (click for details ). It’s an in-line, automatic measurement machine for compactibility, permeability, moisture content % and compression strength measurements. Lab and production scale versions available. We’re opening our sand testing lab for demo and testing your foundry sand too. Request a quote today! You know like us that your green sand technician is often over-loaded with other process control, testing tasks and reports. So the person who should do it all can’t do all the tests required at the frequency of the ideal world. Moreover, archiving and using data is often a pain. Sounds familiar ? Here are the tests you should prioritize for your routine checks. Reason why and other important tests will be discussed in another article soon ( subscribe to SF blog today on top right side bar, it’s free ! ). Wet and hot tensile are interesting tests. In other words, your correlation between green sand properties will greatly suffer with high and variable sand temperature. Of course this requires you invest in a sand temperature control system, which will cool your sand because it’s too hot. If the investment doesn’t make sense to you right now, we will be able to improve your system, but only to a certain limit. Yes, you’ll decrease your sand related casting defects. However, without a sand cooler , you’ll have a hard time controlling and stabilizing green sand properties ( believe our experience, or refer to figure 2 ). You’ll continue to have problems at your molding machine ( or sand-related casting defects ). Figure 2 : Summary of why it’s critical to use a cooling system for green sand. Indeed, varying ( high ) sand temperature influences water content %; varying water content influence pretty much all green sand properties, starting with green compression strength. We don’t like sticky and friable sand. There’s a further step between properties at the mixer, at the lab and what’s working for a given molding machine. Especially if you work with hot sand, moisture content % will vary eratically, so will sand properties. Start by testing the sand samples from the molding machine in two instances : i) when the operator says the sand is working great and ii) when the operator says the sand is a catastrophe. This will be your benchmark for what works and what doesn’t. Figure 3 shows a ” SAND OK ZONE ” delimited by working target lines of %Moisture/%Bentonite ,or H/B ratios, and %Bentonite content on the compression versus moisture % graph. Still, you first need to find what’s working at your molding machine first. For that , relying on the combination of moisture% and compression strength that produce nice molds is a good start. Figure 3 : Example of a work zone for a molding machine. We’ve not talked about how designing patterns to avoid molten metal turbulence during mold filling will make a bad green sand system work tolerably good. We’ll tell you another day how to take the most out of the green sand data you collect. For now, please maintain your muller ( wheels and plow ) and if your sand is hot, find the money to buy a sand temperature control system, it will pay by itself. Make sure you have quality and consistent molding material. Moreover, it should be clear now that it’s more effective to be proactive than reactive. You need to model your green sand system in order to, for example, know how much new sand or bentonite to add to the next batch. If not, you’re too late; you’re making adjustment based on sand properties two hours ago, which are not the properties of the green sand you’re trying to adjust just now. Register today for our next training on OPTICast, FLOWCast and SOLIDCast ( Click )! Or come have a beer and pizza with fellow foundrymen and University Laval students on March 22nd, 17h00 to 20h00. Foundry engineers will share their experience to inspire students with a career in our dear casting industry. So far we have four speakers from four foundries ! Next article will be on your new castingdefect.com mobile app features. Are you more interested in no-bake sand molding or investment casting ? Which alloy? 1. What is the range of in green sand additives For good compressiv strength? Sir so can you help us? Good day Sir, thanks for your comment. Congratulations for your studies. Can I ask which university is that ? About green sand additive, moisture content of 3 and 3.3% is a good starting range to get proper compressive properties. Water % has the most influence on compression strength, see figure 3 above. Then, you need good activated bentonite clay in order to retain that water in your green sand. Without active clay in your green sand, you won’t be able hold water between the layers of clay. We don’t want free water in our sand; we want water trapped in those bentonite layers. I recommend to look at the microstructure view of bentonite clay so you see the layers I’m talking about. Which additive are you referring to specifically ? What Is the persantages of coal dust in green sand mixture? ?